No one disagrees that Gov. Dannel P. Malloy would rely on new revenues close about 40 percent of the projected shortfall in state finances in the next state budget. But how much of that increase represents new taxes and fees? The governor recommends a net state tax increase of $205 million next fiscal year in his new budget proposal. Income credits for middle income and poor households are scaled back. Cigarette taxes rise 45 cents per pack and other tobacco taxes rise. Modifications to the minimum alcohol pricing laws would raise a small amount. The governor’s proposal would set the minimum retail price at actual cost paid. And insurance companies would get a small break in the premiums tax. The value of that net tax hike drops to $167 million in 2018-19 when a proposed reduction in the estate and gift levy would begin. And a tax amnesty program would provide temporary help in the form of $90 million in increased collections over two fiscal years combined. But it’s the fees where things get tricky. A host of miscellaneous fee and penalties changes would raise $56 million more next fiscal year and $96 million in 2018-19. These involve: gun permits; criminal history record checks; record filing; cremation services; urgent care center licensing; boosting the carbonated bottle deposits (which grow from 5 cents to 10 cents); and civil fines for health care facilities. And then there’s Malloy’s plan to bill cities and towns for one-third of the state’s cost of providing municipal teachers’ pensions. Technically, that’s a fee that would require communities to pay $407.8 million in the first year and $420.9 million in the second. Currently the state pays the full amount. If you add those pension charges to cities and towns to the other fees and tax hikes and the tax amnesty, the annual total grows in 2017-18 from $321 million to $729 million. Similarly in 2018-19, the total grows from $322 million to $743 million if the towns’ pension payments are considered a source of fee revenue to the state. The administration argues the new pension billing plan effectively is a spending cut to state government. But the expense really isn’t going away. And the local fee payments will accrue to state finances as revenue, which then will be used to help make those payments. More than seven decades of inadequate contributions approved by governors and legislators have caused this expense to skyrocket. This and similar problems related to other retirement benefit programs are helping to cause major deficit projections for future state budgets. “At a time when state government is making difficult cuts to services, we can no longer exclude how we pay for teachers’ pensions from this conversation,” Malloy said last week. Municipal advocates and others already have said this cost-shift will lead cities and towns to raise local property taxes. 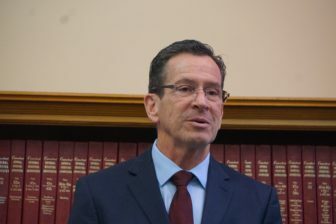 “I praise the governor’s initiative,” said Portland First Selectwoman Susan Bransfield, president of the Connecticut Conference of Municipalities, who lauded Malloy for acknowledging state government’s huge fiscal challenges. But she also predicted that many cities and towns would see this as a huge cost-shift onto local property tax bases. “I need some time to assess the impact it will have,” she said, urging state officials also to consider a municipal finance reorganization plan CCM offered last week. This included broadening the sales tax, boosting the rate to 7 percent, and sharing roughly $700 million in sales tax receipts with cities and towns. The solution “has to work for every city and town in this state, and then we all will be winners,” Bransfield said. Republican legislative leaders said the Democratic governor’s budget simply relies too heavily on new revenue, and not enough on cutting spending. “I have very serious concerns that the governor’s vision for the future is kicking the can down the road and pushing the burden on cities and towns,” said House Minority Leader Themis Klarides, R-Derby. Senate President Pro Tem Martin M. Looney, D-New Haven, a longtime advocate for a more progressive state income tax, said some opponents of that option might rethink their stand as they assess the potential impact of Malloy’s budget on many towns. Looney also said that”some of the governor’s proposals are to be applauded,” including Malloy’s realignment of education grants to favor the poorest communities. The Democratic governor announced earlier this winter that he would not propose any major tax increases, but said last week that smaller increases could not be removed from consideration. Malloy said he would focus primarily on changes to tax credits and exemptions rather than boosting tax rates. The governor’s plan would boost taxes by about $190 million per year in 2017-18, but the overall hike would reach $210 million by 2018-19. The biggest tax increase in the new budget involves canceling the property tax credit. “That has to be on the table,” he said last week. Removing the credit would cost about 874,000 middle-class income tax filers a total of $105 million per year, according to nonpartisan analysts. The governor also would reduce an income tax credit for the working poor, scaling back Connecticut’s Earned Income Tax Credit from 27.5 percent of the federal EITC to 25 percent. Even with this reduction, which would cost poor households about $25 million per year, the state offers one of the most generous EITC’s in the nation. Still, advocates for the credit argue it is one of the most effective forms of tax relief to poor families, as well as effective stimulus. The average recipient gets a credit of more than $400 per year, and advocates say needy families typically spent the entire amount on household needs such as groceries and energy bills. Malloy’s budget would generate about $60 million annually through increased taxes on cigarettes, cigars and other tobacco products. The cigarette tax would climb from $3.90 to $4.35 per pack. The governor’s plan would reduce the estate and gift tax in three steps starting in 2019 by changing income thresholds. This would save taxpayers $20 million in the second year of the new biennium. By reducing the insurance premium tax rate from 1.75 to 1.5 percent, the governor said, it would bolster ongoing efforts to improve an insurance industry that employs more than 58,000 people statewide. This would save insurance companies $11 million in the first year of the new budget and $22 million in the second. Malloy’s other new tax cut, involving the estate and gift levy may prove more controversial. He would phase in estate value exemption levels that match the federal exemptions over three years and reduce the lifetime cap a beneficiary would owe from $20 million to $15 million. The state would forfeit $20 million in 2018-19.
Business advocates say a lower estate tax makes the state more attractive to small business owners and other entrepreneurs. The governor also hopes to generate about $90 million over the next two fiscal years combined by reducing charges on tax delinquents. This would mark the sixth tax amnesty program state government has offered since 1990, or an average of one every five years.